There, I’ve just saved you money, because The Darkest Minds is basically the feature-length version of that sketch, in that it’s a collection of YA movie clichés and tropes done blandly – only this one isn’t meant to be funny or satirical. Instead, it’s a hot mess that has come out way after this trend of movies has stopped being popular, and for good reason. In this movie’s post-apocalyptic setting, because it wouldn’t be a YA movie unless it was post-apocalyptic (and yet, everyone still has perfect hair, skin, facial features, and look remarkably clean for people who probably don’t have immediate access to a water supply), half of the children in America have been killed off by a mysterious wave that’s never really explained, while the remaining half have developed special powers that range from conducting electricity, making things move, controlling minds, and just being very smart. These children have been rounded up and placed into government-controlled camps, where they are sorted into colour-coded groups based on their powers, with orange being the most dangerous. One such child, 16-year-old Ruby (Amandla Stenberg), is an orange, but before she can be properly disposed of she is rescued by her doctor (Mandy Moore), and once she’s free she finds and befriends a small group of fellow-powered young people, with whom she travels and tries to find a place that’s safe for them. 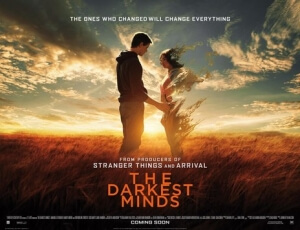 Any YA movie trope, character, or even line of dialogue that you can think of, chances are that they’ll show up at some point in The Darkest Minds; there is not an original bone in its body, nor is there anything unique about it to set itself apart from even the dullest of movies like this. You name it, it’s all here; corrupt and cruel government officials running everything, young people being discriminated against for being different, forced love triangles between two hot guys and the female protagonist, made-up names for very straightforward things, and of course that precious post-apocalyptic backdrop. Hell, they even make specific references to Harry Potter at one point, and while that’s not technically YA fiction it’s still one of the biggest child-centric stories in modern literary history, and practically spawned all these knock-off book and film series in the first place. It’s so unashamedly clichéd and generic that it almost makes it a funnier watch than that SNL sketch from earlier, because you just can’t believe how stock and unoriginal this story, these characters, this setting and everything else is, like the studio took a bunch of these movies and stuck them in a blender, without once considering that what made some of those movies work was the fact that they had intriguing stories, strong characters, and the occasional social commentary that really carried the plot forward. None of that appears in any way shape or form in this movie, as instead it’s a cynical and manufactured attempt by the studio to reignite this trend of YA movies, with nothing of substance or even style (the latter is a particular let-down because this was directed by Jennifer Yuh Nelson, who previously directed the two Kung Fu Panda sequels which, if you remember them fondly, were not only stylish but gorgeous to look at; this movie is directed and shot as blandly as you’d think a movie like this would be). It’s such a bore to sit through, because again you know each and every plot turn it’s going to take since you’ve seen it done before and much better in other YA movies, and you’re gobsmacked that the characters aren’t smart enough to see some of these surprises coming a mile away, and keep in mind that one of their superpowers is apparently superintelligence. People show up who might as well have the word “villain” tattooed across their forehead, others will do and say things that will come into play later for twists you can predict even before the film reveals them, and it wastes good actors like Amandla Stenberg – who’s stuck playing the same stock female protagonist you’ve seen the likes of Jennifer Lawrence, Shailene Woodley and Chloe Grace Moretz play in the past – Bradley Whitford – who shows up in scenes that set him up to be the big bad but is easily disposed of off-screen – and Gwendoline Christie – who appears in a very small role which, let’s be honest, isn’t the biggest waste of this actress in a major Hollywood franchise as of late – in parts that nobody could pull off, because it’s a dumb script given some pretty bland direction on top of it. There’s a reason that these kinds of movies stopped being popular, roughly around the time that the final Hunger Games movie came out; it’s because nobody can seem to add anything new to the mixture, and a lot of them feel so similar now that they may as well blend together to make one whole. The Darkest Minds is that whole, and it’s a movie that’s probably best left in a hole. The Darkest Minds takes every trope and cliché imaginable from the YA movie catalogue and does absolutely nothing with them, resulting in a boring and shockingly unoriginal mess that’s not worth anybody’s time.